This article first appeared in The Edge Malaysia Weekly, on August 13, 2018 - August 19, 2018. AS the US$250 million Equanimity cruised across the globe, from the Netherlands to Monaco to Bali, none of its passengers would have guessed that one day, the superyacht would be seized and docked alongside other not-so-luxurious vessels in the murky waters of Port Klang. It has not been plain sailing for Equanimity since GE14 on May 9. 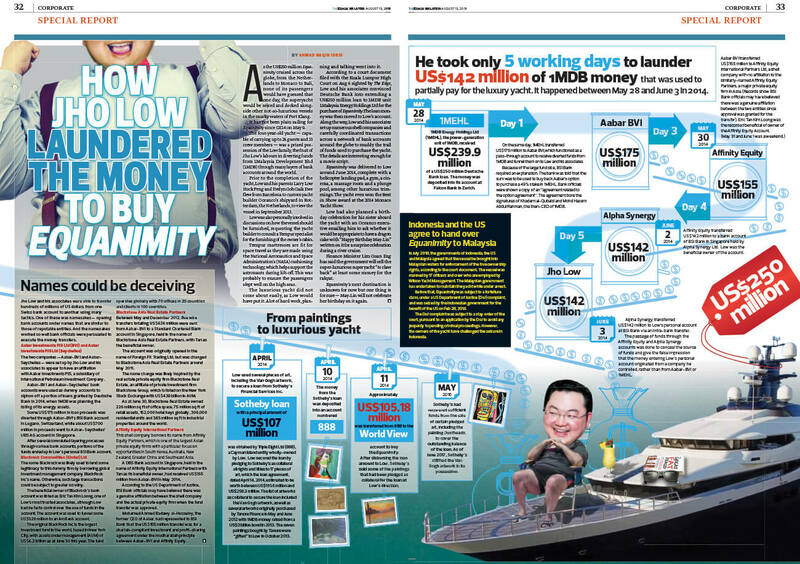 The four-year-old yacht — capable of carrying up to 26 guests and 33 crew members — was a prized possession of the Low family, the fruit of Jho Low’s labours in diverting funds from 1Malaysia Development Bhd (1MDB) through many layers of bank accounts around the world. Prior to the completion of the yacht, Low and his parents Larry Low Hock Peng and Evelyn Goh Gaik Ewe flew from Barcelona to custom yacht builder Oceanco’s shipyard in Rotterdam, the Netherlands, to view the vessel in September 2013. Low was also personally involved in discussions on how the vessel should be furnished, requesting the yacht builder to consult a Tempur specialist for the furnishing of the owner’s cabin. Tempur mattresses are fit for space travel as they are made using the National Aeronautics and Space Administration’s (NASA) cushioning technology, which helps support the astronauts during lift-off. This was probably to ensure the passengers slept well on the high seas. The luxurious yacht did not come about easily, as Low would have put it. A lot of hard work, planning and talking went into it. According to a court document filed with the Kuala Lumpur High Court on Aug 6 sighted by The Edge, Low and his associates convinced Deutsche Bank into extending a US$250 million loan to 1MDB unit 1Malaysia Energy Holdings Ltd for the purchase of Equanimity. The loan money was then moved to Low’s account. Along the way, Low and his associates set up numerous shell companies and carefully coordinated transactions across a network of bank accounts around the globe to muddy the trail of funds used to purchase the yacht. The details are interesting enough for a movie script. Equanimity was delivered to Low around June 2014, complete with a helicopter landing pad, a gym, a cinema, a massage room and a plunge pool, among other luxurious trimmings. The yacht even won the Best in Show award at the 2014 Monaco Yacht Show. Low had also planned a birthday celebration for his sister aboard the yacht with an Oceanco executive emailing him to ask whether it would be appropriate to have a dragon cake with “Happy Birthday May-Lin” written on it for a surprise celebration during a river cruise. Finance Minister Lim Guan Eng has said the government will sell the super-luxurious superyacht “to claw back” at least some money for the rakyat. Equanimity’s next destination is unknown for now but one thing is for sure — May-Lin will not celebrate her birthday on it again.